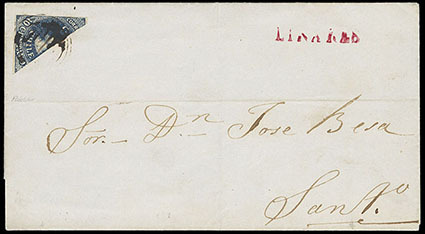 Chile, 1854, Columbus, 10c deep blue, diagonal bisect, lower left portion of stamp tied by target handstamp on 1857 folded letter sheet to Santiago, with red "Linares" origin straight line handstamp at right, Very Fine. Scott No. 5d Estimate $200 - 300. 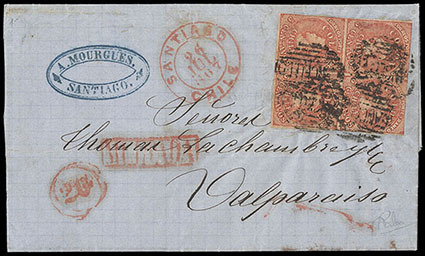 Chile, 1858, Columbus, 5c pale orange, in combination with 1862, 10c blue on bluish on 1862 Santiago folded letter to Valparaiso, each tied by barred "Cancelled" oval handstamp, with red "Multada" boxed handstamp and matching "10" in circle rate handstamp, enclosure with interesting content regarding the lateness of the previous delivery of mail, Very Fine. Scott No. 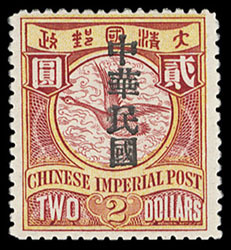 9 var.+12b Estimate $2,500 - 3,500. A RARE 1858-62 5C AND 10C COLUMBUS ISSUE COMBINATION USAGE FROM SANTIAGO. Chile, 1861, Columbus, 5c orange red, fine single tied by target handstamp on folded letter sheet to Sheffield, England, red "Valparaiso, 17 Abril, 61" origin cds alongside, manuscript "2/-" due rating, reverse with red London entry and receiving cds's, inside the closing of letter with British Consulate cachet handstamp, Very Fine. Scott No. 9b Estimate $400 - 600. 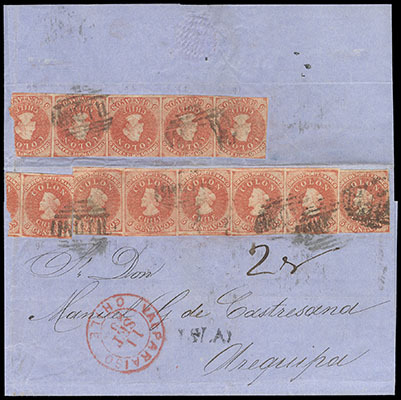 Chile, 1856, Columbus, 5c vermilion, horizontal strip of six, strip of five and single, used on 1863 folded letter sheet to Arequipa, Peru, with strip of six originally wrapped around the cover and thus torn on opening, tied by barred "Inutil" oval handstamps with bold red "Valparaiso, Chile, Set 11, 63" origin cds, straight line "Yslay" handstamp and manuscript "2 rs" due on front, Very Fine for this. Scott No. 9d Estimate $3,000 - 4,000. 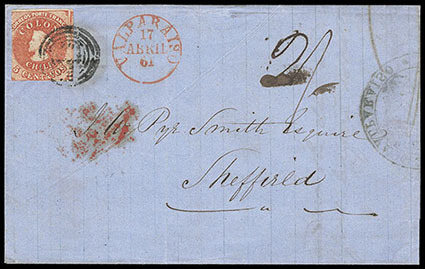 A UNIQUE MULTIPLE FRANKING OF THE 1856 5C COLUMBUS ISSUE. 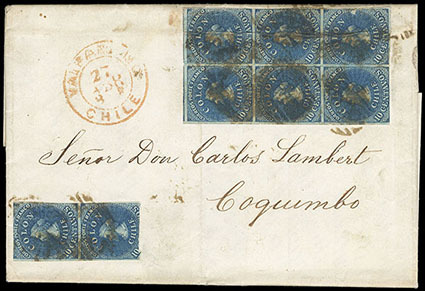 Chile, 1859, Columbus, 10c pale slate blue, watermark e, block of 4, mute circular grid cancels, ample to huge margins showing significant portions of adjacent stamps at left, strong bright color, still Very Fine for this, only two to three such blocks are believed to exist; with 1992 B.P.A. certificate. Scott No. 10h Estimate $3,000 - 4,000. A VERY RARE USED BLOCK OF THE 1859 10C SANTIAGO PRINT ISSUE IN THE SLATE BLUE SHADE. 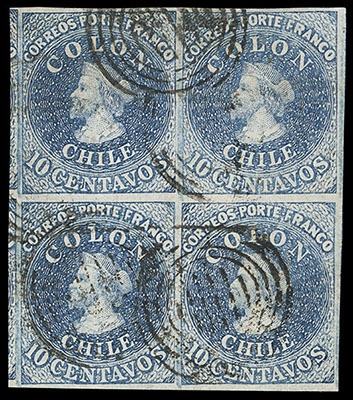 Chile, 1862, Columbus, 10c bright blue on blued, block of six and vertical pair, on 1865 folded letter from Valparaiso to Coquimbo, all tied by brown barred "Cancelled" oval handstamps, red "Valparaiso, Chile, 27 Abr" cds, enclosure in English stating that the writer encloses two further accounts forms and correspondence; block with light file fold creases, F.-V.F. appearance. Scott No. 12b Estimate $3,000 - 4,000. A RARE AND POSSIBLY UNIQUE MULTIPLE USAGE OF THE 1862 10C COLUMBUS ISSUE. 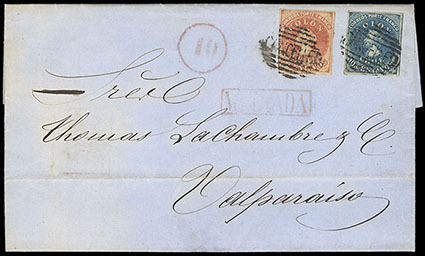 Chile, 1865, Columbus, 5c rose red, block of four, margins ample to just in at top, tied by barred "Canceled" in oval handstamp on 1867 folded letter from Santiago to Valparaiso, with clear red "Santiago, Chile, 26 Jul, 1867" cds with matching boxed Multada and circular "20" rate handstamps; block lifted and placed back in position, Very Fine, ex-"Islander". Scott No. 14 Estimate $3,000 - 4,000. AN EXTREMELY RARE BLOCK OF THE 1865 5C SANTIAGO PRINT ISSUE USED ON COVER. 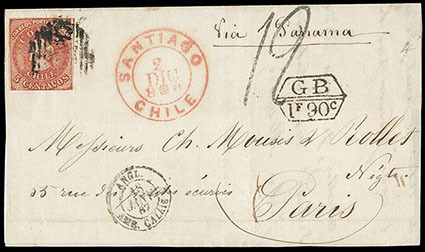 Chile, 1865, Columbus, 5c vermilion, fine single tied by barred "Canceled" handstamp on cover front with backflap to Paris, France, bold red "Santiago, 2 Dic" origin cds and Via Panama routing endorsement, "G.B./1f 90c" accountancy handstamp and London transit backstamp, Calais transit and "19" decimes due handstamp, Very Fine. Scott No. 14f Estimate $200 - 300. China, 1912, Statistical Dept. "Republic" overprint, $2 carmine & yellow, full o.g., well centered, fresh with bright colors, Very Fine and choice; with 2018 A.P.S. certificate. 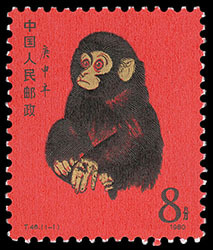 China (People's Republic), 1980, Year of the Monkey (T46), o.g., never hinged (usual slight offset on gum), Very Fine.